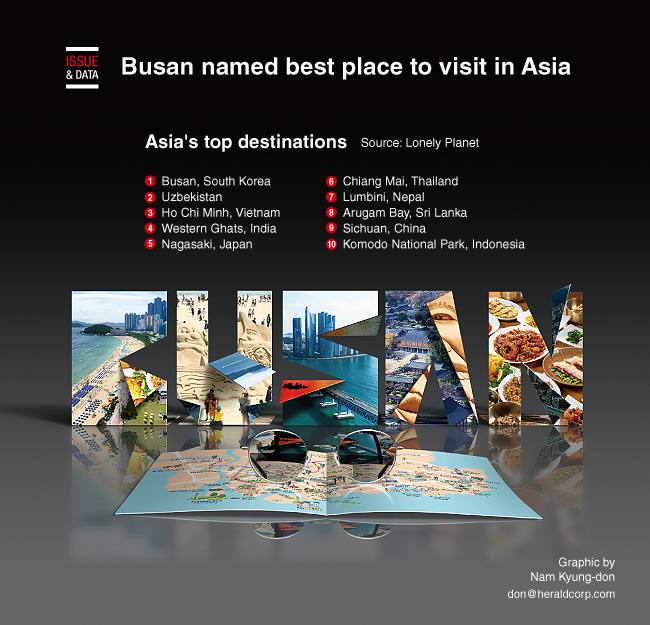 South Korea's portside city of Busan has been named the best destination in Asia 2018 by the travel experts at Lonely Planet, who describe the bustling city as a confluence of culture and cuisine. For the third edition of LP's "Best in Asia" list, editors rounded up 10 destinations worth visiting over the next 12 months, which span East, South and Western Asia. In May, Busan hosted an opening ceremony celebrating its title as East Asia's Culture City 2018, as part of a joint agreement between Japan, China and Korea. Every year, three cities are selected to promote artistic and cultural development in the region. Busan shares the title this year with Harbin, China and Kanazawa in Japan. The city also tops the "Best in Asia" list for offering travelers an "eclectic" offering of activities, from hikes up to Buddhist temples and hot springs to seafood feasts at the largest fish market in the country, editors say. Uzbekistan and Vietnam's Ho Chi Minh City were ranked second and third respectively.